I'm not a huge fan of chain restaurants, even if they are BBQ joints. Which is why I had not noticed that the Dickey's BBQ near my office had suddenly been converted to Sugarfire Smokehouse. I figured it was a good sign that they always seemed to be busy at lunch time. In fact, too busy for me to try the place. But this weekend, I happened by there just after they opened and was finally able to try it out. I was encouraged by the Ole Hickory smoker sitting on the patio right by the front door. Thats an odd place for your pit, but I've eaten some really food BBQ out of one of those pits, so i took it as another good sign. There a few remnants of the former Dickey's, but I was encouraged to see the place rearranged with the kitchen in full view and lots of employees busily prepping for the lunch crowd. Like a lot of classic BBQ joints, the menu was written in chalk at the order station. That's not a bad thing, unless you use a lot of unique names for your menu items. There's no place on the chalkboard to describe what a "Big Muddy" sand which is for example. Nonetheless, I ordered up the 2 meat platter and watched as the guy at the counter pulled out a large tray covered with butcher paper and piled on pulled pork and freshly sliced brisket. Down the cafeteria-style line I went, adding bbq beans and hand cut fries to my meal. And like any self respecting BBQ joint, sweet tea completed my order. I grabbed a seat at one of the tables left over from the days as a Dickey's franchise and eyed the four bottles of clearly homemade sauces that seem to be a requirement for any BBQ joint these days. I got what I expected from the Texas Hot, Sweet BBQ, & White Sauces. But I cautiously tried the "Cherry" sauce as indicated (as they all were) by the handwritten masking tape label. Let me just say that I hope that's not a regular sauce and just an experiment, cause it was not good. Other than my dislike of the Cherry sauce, I didn't find another thing that wasn't good. 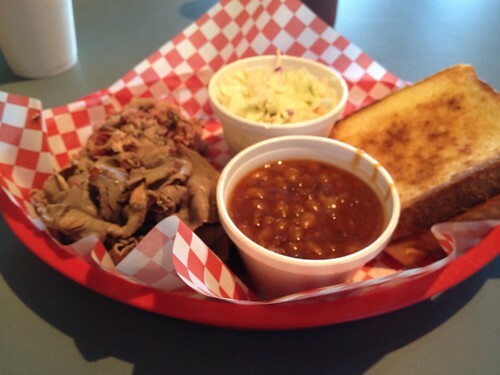 The pork & brisket were moist and tender, the bark was tasty, and the sides were very good. The portions were very generous, and I found the meal to be a good value overall.